Although it is man-made wetland, the Urrbrae Wetland has been designed to function as a water retention basin whilst having the benefits of natural wetland characteristics. - The water flow is slowed down causing sand and sediments to fall to the bottom, this is called sedimentation. - Reeds, sedges and other native plants that make up the riparian zone, filter out much of the of salts and heavy metals. The wetlands is able to store up to 17.7 milion litres of water (thats over 7 olympic swimming pools). Every year, between 300-400 million litres of stormwater will flow through the wetland. The wetlands have been planted with local plants, providing a home for numerous species of birds, reptiles, amphibians and macro invertebrates. The Urrbrae Wetlands offers authentic and engaging learning oppertunities for every age group in any learning area. Harvested stormwater is used to irrigate the vine yards are Urrbrae Agricultural High School, taking pressure of the Murray River system. 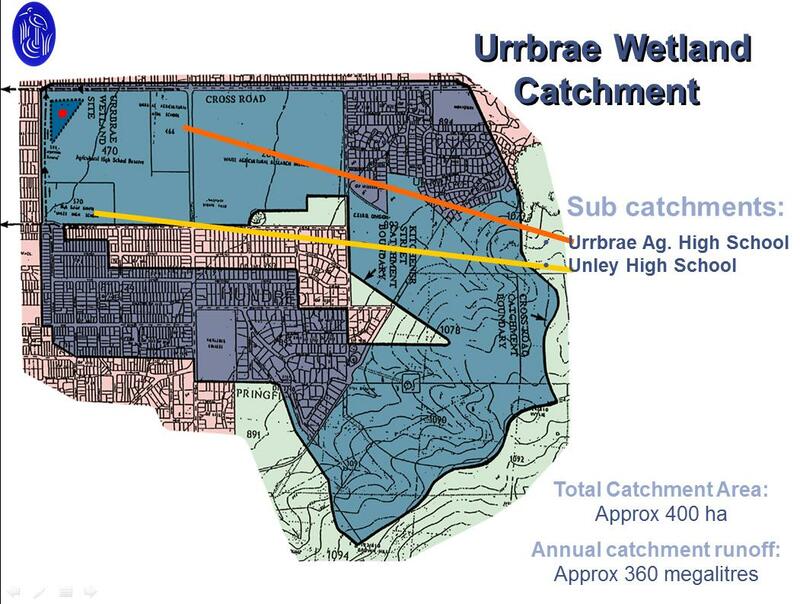 While the Urrbrae Wetland only cover an area of approximately 6 hectares its catchment area is around 380 hectares (see figure below). That means that any drop of water, which falls in this area could potentially end up in the wetland, along with many different pollutants that the water picks up along way. Before the wetlands were developed this water and its polluants would have continued to flow through the storm water pipes, flowing into Brown Hill Creek and the Patawalonga then taken the polluants out to sea. BUT the wetland stops many of the pollutants from continuing their journey. - Reduces the frequency of local flooding. - Removes rubbish, organic matter, pathogens chemicals and other pollutants from the water. - Captures and filters the storm water so that it can be use for irrigation purposes on Urrbrae Farm. - Provides a protected habitat for native flora and fauna, thus increasing the biodiversity of the area. - Provides a valuable education resource. - Cleans incomming storm water, thereby improving the quality of water that is entering Brown Hill Creek, the Patawalonga basin and the Gulf of St Vincent. - Provides an education site to students from the region, so they can develop ways to improve water sustainability in their own localities. - Cleans storm water, allowing it to the reused for irrigation, thereby taking the pressure of the ailing Murray River. - Environmental, Economical and Social impacts of Urban Wetlands at a Local, Regional and National level. Does the wetland actually clean the water? This activity involves the student taking water samples from three different locations around the wetland. The students then carryout a range of test on each sample including testing the nitrate, phosphate and dissolved oxygen levels, measure turbidity, salt and pH. They investigate what a heathly range is for each test, analyse their results and answer the proposed question - Does the Wetland Actually Clean the Water? - Design an artificial wetland which considers - The lining, clay or plastic? why? - What would happen if fertilizers and phosphates were to leak into the Urrbrae Wetland? - Should roads become permeable? 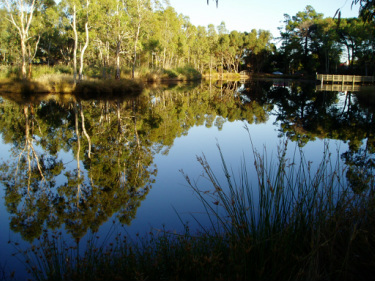 To find our more on how The Urrbrae Wetland Facility can assist you in achieving outcomes based around urban wetland importance and function, simply contact the Wetland Manager.